The park is a fusion of natural and highly landscaped terrain. Nestled amidst wooded slopes and open lawns lie two horticultural destinations: the Heather Garden and the Alpine Garden. Each area showcases flowers and plants that are well adapted to the unique and varied terrain of Fort Tryon Park. The Heather and Alpine Gardens were part of the original Olmsted Brothers design. The beautiful flowers in Fort Tryon Park enthrall and soothe visitors, locals, children, students, and naturalists of every stripe throughout the year. Our natural treasures include 46 American elms, many of which predate the park, and more than 550 varieties of plants, trees, and shrubs. It is repeatedly named as one of the best places to celebrate each season – especially spring and fall – by several NYC publications. See what’s in bloom this season! Download the Fort Tryon Park Trust’s Bloom Guide. Find out about the historic American elm trees. The crown jewel of Fort Tryon Park, the Heather Garden is a three-acre garden of unparalleled beauty and diversity in every season, boasting one of the largest heath and heather collections on the East Coast, a 600-linear-foot perennial border, and over 550 varieties of plants, including trees, shrubs, perennials, and bulbs. The Heather Garden is the largest public garden with unrestricted access in New York City. Flanked by stone walls and the remnants of Cornelius G.K. Billings’ early 1900’s estate and featuring spectacular views of the Hudson River, the Heather Garden hosts over 30 varieties of heaths (Erica carnea and Erica x darlyensis) and heathers (Calluna vulgaris), whose winter and summer blooms and colorful foliage create a delightful array of color year round. Hundreds of varieties of perennials and shrubs add eye-catching shapes, textures and contrasts to the Heather Garden. Today’s visitors may be surprised to learn that after the fiscal crisis of the 1970’s, much of the garden’s original splendor was entirely lost to overgrowth, invasive tree growth, and declining maintenance. Even the views of the Hudson River were obstructed. The vistas visitors enjoy today are largely the result of the 1983 Landscape Restoration Plan. Jane Schachat, a former Park Administrator, painstakingly oversaw the Heather Garden’s restoration, which was funded by the Greenacre Foundation and executed by landscape architect and Trust Board Member Nicholas Quennell of Quennell Rothschild & Partners. Over the last several decades, the Greenacre Foundation and, more recently, the Fort Tryon Park Trust, have continued to fund dedicated staffing and horticultural supplies, equipment and plants to complement the resources of NYC Parks to preserve the splendor of the Heather Garden. 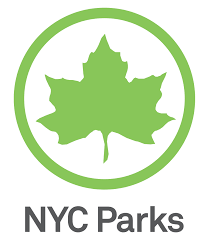 Since the park’s 75th birthday in 2010, the Fort Tryon Park Trust has invested $450,000 in private funds to strengthen the garden and ensure it is sustained for future generations. In October 2010, The Trust engaged Public Garden Designers Lynden B. Miller and Ronda M. Brands to re-invigorate the planting design and develop a Framework Plan for enhancing and sustaining the Heather Garden for the long term. Miller, an icon of public garden design, has created vibrant plantings in innumerable NYC parks over the past four decades, including Central Park’s Conservatory Garden, Bryant Park, Madison Square Park, and the Perennial Garden at the New York Botanical Garden. Brands is the designer of numerous public and private spaces in NYC and beyond, including seasonal displays for the Museum of Modern Art’s sculpture garden and the redesign of the Katharine Hepburn Garden plantings at Dag Hammarskjold Plaza. Miller and Brands have collaborated together on more than a dozen garden design projects, including the Queen Elizabeth II Garden in Hanover Square and gardens in Hudson River Park, at the Bayard Cutting Arboretum, and on the campuses of Columbia, Princeton, and Stony Brook Universities. Miller and Brands worked with the Fort Tryon Park Trust and the Parks Department to identify ways to build upon the unique horticultural and historic assets of the Heather Garden and to ensure that they remain featured in the garden throughout its lifetime. The team met with the Heather Garden gardeners, culling their knowledge of the garden’s problems and strengths, mapped out all existing conditions, and compiled year-round bloom lists of plants and shrubs used to enhance the garden and respect the spirit of the original Olmsted Brothers plan. The Framework Plan tackled recurring soil problems, identified ways to open up and frame views, expand existing perennial groupings, and incorporate small shrubs at key locations to create more structure and cohesiveness in the garden year round. The approach will help minimize ongoing maintenance of the garden, and yet preserve its romantic feel and otherworldly aura. In addition to serving as a guide for the garden’s ongoing management, the Framework Plan facilitates fundraising to ensure the garden’s future care. The work of Miller and Brands and the ongoing collaboration of Brands with our team has resulted in a stunning horticultural asset that is beautiful in every season. The wild heather, found in the British Isles, Europe, and Asia Minor and naturalized in Newfoundland, Labrador, and Cape Cod, requires moist, acidic, well drained peaty soils and year-round protection from the wind. In Fort Tryon’s Heather Garden, emulating the quiet and harmony of this type of landscape is a constant challenge. Our soils are rich with clay, New York City summers are hot and dry, and the winter winds are brutal to these ground-hugging plants. The dedicated gardeners work under the guidance and inspiration of the Northeast Heather Society to nurture and maintain the heaths and heathers. In turn, Parks Department staff mentor seasonal workers in the intensive horticultural practices the garden requires. Within the Heather Bed, thousands of plants, representing over two dozen varieties of heaths (Erica carnea and Erica x darlyensis) and heathers (Calluna vulgaris), appear in a constantly changing tapestry of color and texture that is punctuated by evergreen shrubs, mature elms, seasonal annuals, and perennials. While the heaths flower from winter to early spring, heathers bloom in mid-summer. Both are evergreen, though the leaves are not always green. Some heather’s leaves turn silver, copper, red, or chocolate in winter. The changing colors and the variety of shapes and textures of the plants provide year-round interest. When the Alpine Garden was constructed, it was the first of its kind to appear in a public park. Until then, alpine gardens appeared primarily on private estates in Europe and North America, but not in public parks. Alpine gardens are generally characterized by extensive use of rocks or stones and plants native to rocky or alpine environments. Often they are designed to mimic natural rock outcrops. Because of harsh growing conditions, alpine plants are usually small, low growing, or creeping. Their diminutive form makes them desirable to the landscape designer because they do not obscure the rocks and other elements of the alpine garden. 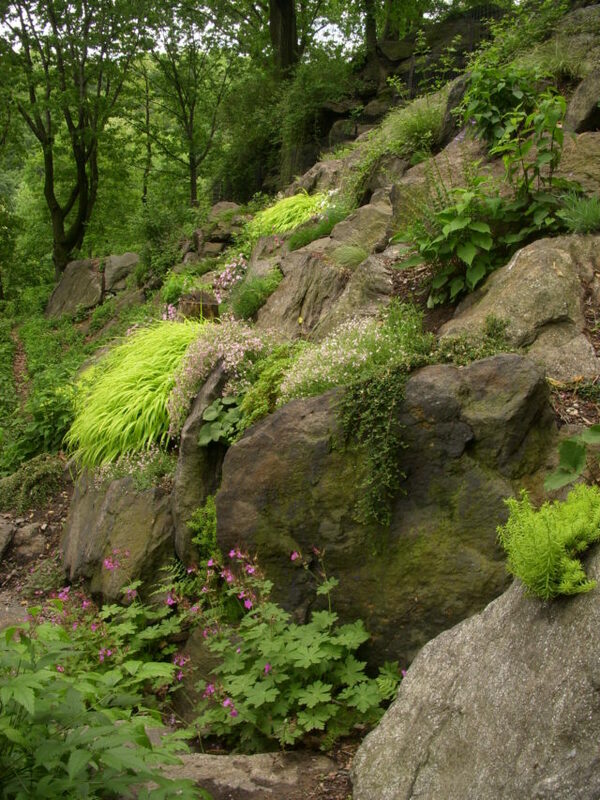 The genius in the Olmsted Brothers’ design for the Fort Tryon Park Alpine Garden is their sublime realization of the potential for a rough, almost impenetrable rocky slope. They transformed the coarse terrain into a series of intriguing pathways and plantings that wander up and down the 150–foot rock–faced slope between Broadway and The Met Cloisters. The Alpine Garden’s decorative rocks – walls, boulders, and stone borders — part of a complex human design, complement the outcroppings of metamorphic Manhattan schist, containing easily seen minerals such as quartz, feldspar, and mica, while garnet is found at scattered places. Some of the decorative stone used in the construction of the Alpine Garden came from rock excavated in the construction of Fort Tryon Park and the nearby subway tunnel.